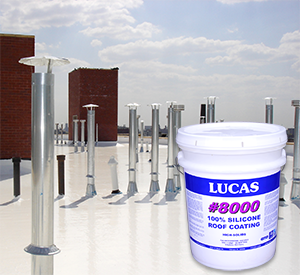 Lucas #8000 100% Silicone Roof Coating is a 98% solids moisture-cure coating intended for the repair and restoration of asphalt, modified bitumen, metal, concrete, TPO, PVC, KEE(Fibertite), Hypalon (CSPE), PIB and EPDM roofs. 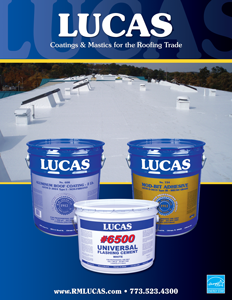 Silicone’s low water absorption allows for improved ponding water resistance. Fast cure time allows for same day recoating. Contains no solvents and is low odor and no water so it will not freeze. VOC compliant in all of North America. #8500 is a thicker mastic version of #8000 for repairs. When installed in white, #8000 will reflect solar energy and reduce interior building temperatures while improving the efficiency of rooftop air conditioning units.